It’s the most addictive match-3 puzzle game that everyone can play and enjoy! Join the flower match 3 game today and experience endless fun in a splendid match-3 world filled with beautiful flowers, cool bonuses and surprises. 1. Link 3 flowers to create a line blast and win points. 2. Solve all the fun puzzles. 3. Complete the missions set at the beginning of each new level. 4. Connect flowers and create special flower combos. 5. Match 4 flowers to get a striped item of this color and create a line flowers blast. 6. Match 5 beautiful flowers in an L or T form to get a bomb that will explode surrounding items. 7. 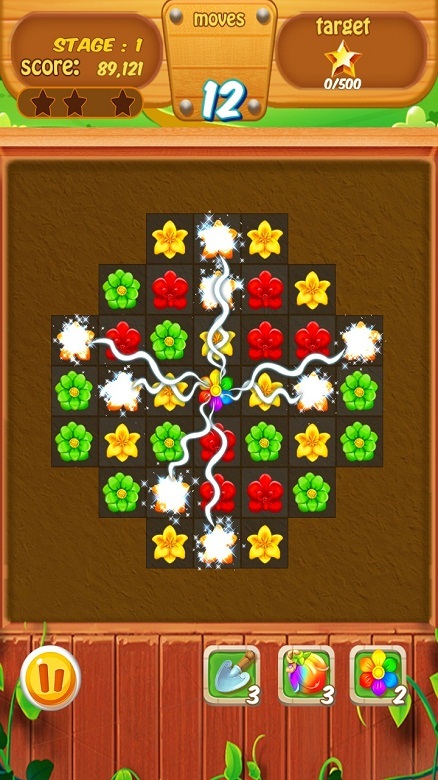 Match 5 flowers in a row to get a rainbow blast. 8. Unlock awesome boosters that will help you get through levels.